Pool Maintenance, Repairs and Renovation in Mar Menor, Costa Calida, Costa Blanca and the rest of Murcia. 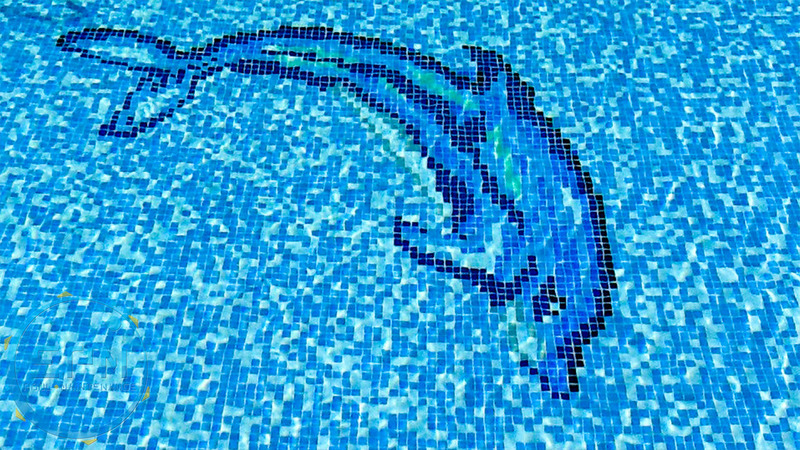 EPM Pools is a division within EPM Pools & Construction, responsible for swimming pool maintenance, repair and renovation. We also install protective covers for your pool, salt chlorinators, heat pumps and many other accessories. If you are interested in any of our services please do not hesitate to contact us. We will be happy to help. Do you want to save time, energy and water every year? It’s possible if you keep an eye on your pool. Our swimming pool maintenance team can do this for you and more. We see maintenance as an investment in prevention. You can only prevent so much as pools age just like us. We are here to help you when the time comes to repair or upgrade your pool. If your pool is beyond repair, we also specialize in renovation. We believe that outdated or damaged equipment are best addressed sooner than later, this way preventing further repairs. In addition to maintenance, repair & renovation, EPM Pools offers a wide variety of accessories and upgrades for your pool. Covers and Roll cover: They can save you 10,000 litres of water monthly, avoiding the evaporation of the pool water up to a 97%. Also, they rise the temperature of the water using the sunlight up to 8º more, so you can enjoy your pool more time. In addition, they keep the leaves and dirty away from the water and save you to use that much chemicals. We have a wide catalogue that can be addapted to your needs. Pool Heaters: With our wide range of pool heaters you will raise the temperature of your pool enough to enjoy it the whole year. 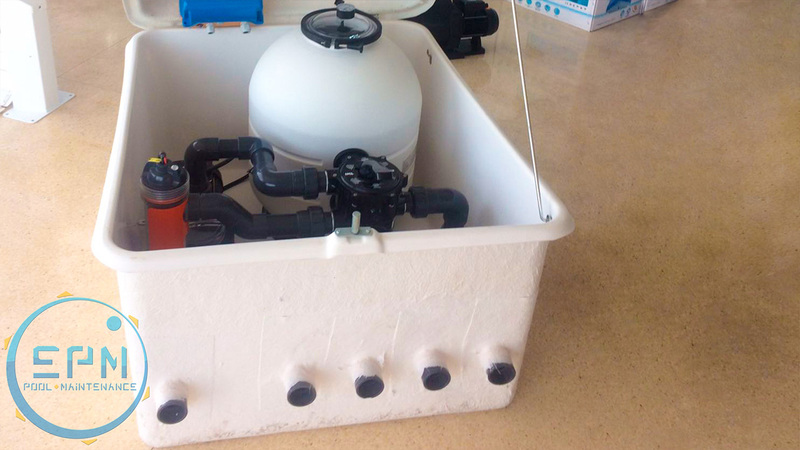 With the time is possible you have to replace some components of your filtering system. We will help you to chose the right one. And if you need us to fit it, won’t be a problem. Salt Systems: If you don’t like to bother with the chemichals or the red eyes, installing this system you can forget about it. Also, they are more durable and effective than chlorine systems. Chemicals: In summer time the levels have to be checked very often to guarantee a good swimm. In winter, your pool also need to be treated. Others: When we visit your pool, our team will check all the above, but also we can check your pump, refill the water and remove the scales from the tiles if needed. If you don’t want to empty your pool and waste a large amount of water and money, the maintenance is the key. We can customize our contract depending on your needs and time… Call us! Our project development team will hear your ideas for your new pool and will give you the best advice, helping you to buid the swimming pool of your dreams. We can guarantee that our team have a vast experience on this sector and will do an excellent job. There’s no small jobs for us. Every single one is special. Waterfalls: Incorporating a cascade of water on the wall of your pool is aesthetic and relaxing. The professional team of EPM POOLS is specialized in doing these jobs. Whether you have a wall nearby or not, call us so we can design a waterfall that fits your pool. A curtain of water will come almost magically from our wall and fall directly into the water. Gazebo: Do you have a place near the pool that looks ideal for relax, read and have a drink after a refresing swim? EPM can build for you that place to stay checking the pool while the kids are playing around. Gardens: Your pool is surrounded by a garden and you want to change that into something else that is running trough your mind? EPM can tile this and make paths or flat areas, or the other way round. Divisions: Privacy in your garden? Its possible with EPM. We will build a wall where you need or we will give our advice if you dont know where to put it. 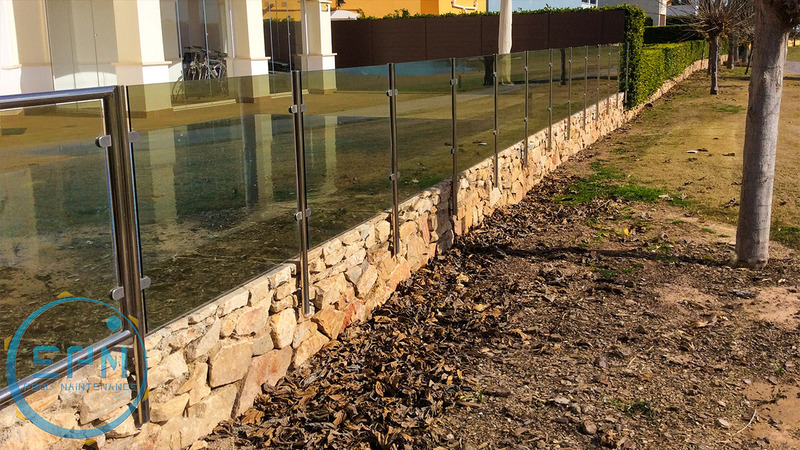 Also, if you need a clear fence so you can see your garden, EPM will do it for you. Cleaning: Having time or not, your pool needs atention. Clean the bottom, check levels and empty the filters. Are you looking for construction services? New pools, house extensions, refurbishment, kitchens, bathrooms, gardens, garages, paving, etc… Head over to our “EPM Construction” website for more information. Because we are interested in your project; big or small. Pool maintenance, repair and renovation work is just important to us as new construction. Every job is special to us and we value every part of the process, from the smallest repair to the biggest renovation. Because of our attention to detail and excellent after-sales. We offer a wide variety of services and products to help you maintain your pool long-term. Check out some of our work and accessories below. We promise to answer as soon as possible!